Guideline and protocols frequently precisely define administration of interventions. For practitioners seeking non-invasive ways to help their patients with pain that won’t quit despite following the guidelines. Silicon Valley’s thinking is all about real-time observations, numbers, and feedback for control. The quest to maintain Moore’s Law brings you faster, cheaper computers. You may know about IBM’s quantum computing that will someday make AI for medicine mainstream. Can your patients wait that long? This man waited 30 years for his cold hands to warm like his friends hands. PhotoMed’s algorithm prompted his hand thermostat to reset to “comfortable” during each of three visits. PhotoMed’s team of nerdy engineers developed the algorithm for pain specialists. To name a few; anesthesiologists, physiatrists, neurologists, and neuroscientists. But most important are the patients waiting with pain or “ouchless” impairments that won’t quit. Each specialist has their own professional perspective. Guidelines and protocols aren’t flexible. It hurts to send a patient home underserved. Do you wish that you could improve the life of one more person and their family each day? 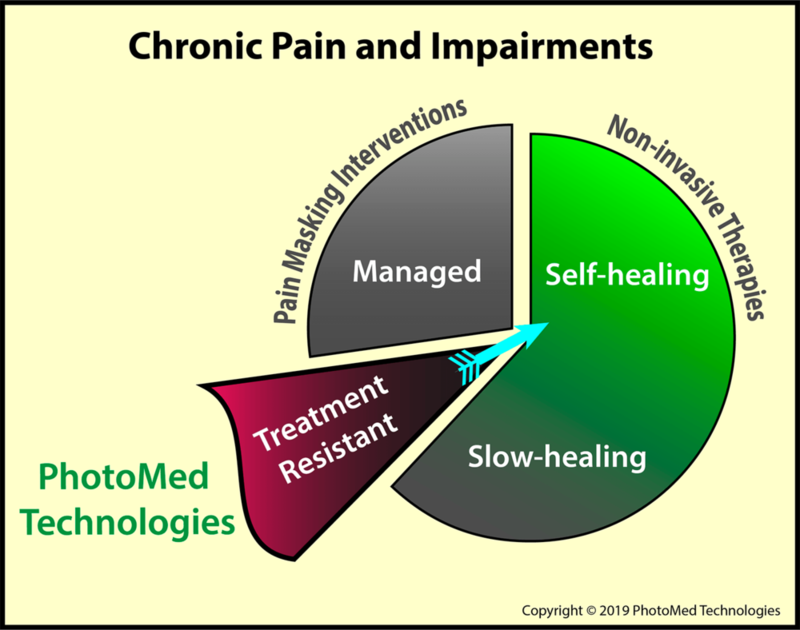 Does PhotoMed’s algorithm work for every type of pain or impairment? Of course not. Objective feedback, in seconds to minutes, lets the operator converge on relief for the individual patient. The logic is the same as for invasive interventions, but 1000x faster. Uses only 2 cents worth of electricity. PhotoMed’s team made the Instant Feedback System™ for you to document events that others may think impossible. After guidelines end, they need something else. The guidelines addressed the chronically acute targets to zap. What left to shoot? Instead of the customary one wavelength, the operator has 282 wavelengths to algorithmically select. Efficient flexibility is the secret to success. Find a wavelength that works. Your done when you observe improving function, like warming of cold hands.